MUFF WIGGLER :: View topic - Quad VCA anyone? I modified my VC Mixer (I was suppose to be working on the sequencer) and essentially removed the summation portion, separating the individual channel outputs. It gets rid of the inverted output and pretty much fills out my 16-control format providing a signal input, Control CV input, attenuator and output per channel. It also added a change from a dual op amp to a quad, 4 caps and 4 resistors. Somehow, I managed to find spaces for them. Makes for a nice, compact quad basic VCA with cascaded control CV inputs. The bonus is that each channels' maximum gain can be set by the user. Should I order some boards? Any takers? That sounds smart. God knows, the VC mixer is very smart. The design is done and my hack job was successful. I'm going to go play with subtle applications today. Such as, VC of various CV application and routing rather than getting stuck in a groove of just using them for audio applications. So what are the differences between this and the CV mixer? Four in, four out. No mixing/summing. It's just a variation of the same design. Instead of all 4 channels being mixed together to one output, they're all available individually. You can route each channel to different applications. i.e: using one on a feedback loop for a VC resonance, another for voltage control of a modulation source before it's destination module, another for VC control of a support VCO output into a mix...etc. Otherwise, you just have one output on the VCM (2 if you count the inverted out) so, it's great for mixing cv's or audio going to a single destination. Oddly enough, it took more components to do that since each output had to be buffered independently. Interesting. How involved a mod would it be to add a "Lin/Exp" switch for each input to choose the CV response? Sounds like the module i've been designing for the last 2 months. Due to release in a month or two..
Just need to lay the pcb out. Hope to do that this week. function details remain my own business till closer to launch. 4 VCA input, 5 VCA out w/ mix buss and CV master. thats all for now kids. Actually, pretty involved. I ran out of space on my board for any more parts and/or I/O connectors. Sounds great George. I've just got far too much on my plate to be considering any new projects at the moment but further down the track I'd be interested for sure. LOL. I know that story. I had to make myself do this. 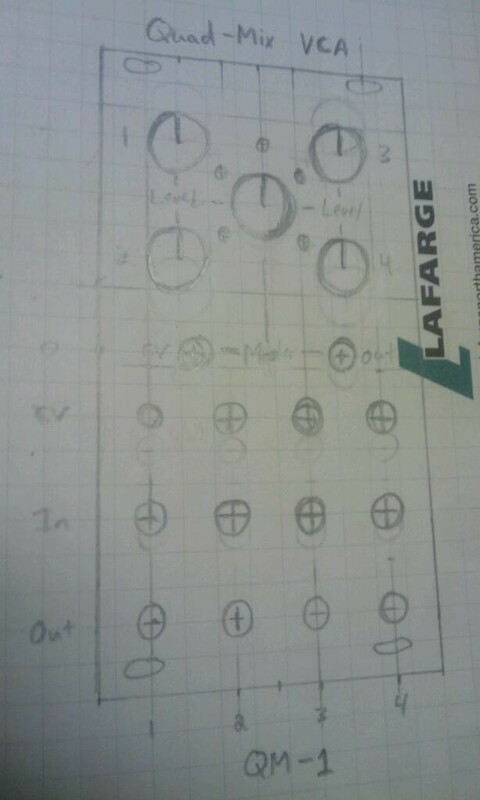 It's a simple quad AD, an input, output and an Attack and Decay pot for each channel. Think I'll call it QuAD. Between the two, it makes for a nice sprinkling of quickie EG/VCA combo's that don't require full blow ADSR's and VCA's. I'll have to check these out a the meeting next month! Now you're talking. Will the quAD be strictly AD or is ASR possible? Sorry, I shouldn't be pushing for feature creep so hard on such compact quad modules. Don't know. I designed it but haven't prototyped it. For some reason, my brain isn't sure what it's going to do with a continued gate. ASR is easy, just slew a gate. I was thinking of that last night. My thought is to put a 4 pos dip switch on the board if I can and let the user decide which they prefer. That would allow for selecting either mode for either channel. The gate input channels all use my typical interrupting cascade scheme. I'll keep you all informed. I'm just having fun. I want to try my 4X gate delay with the QuAD going to the Quad VCA. Not sure what to process but, I like the chain. OK, I have it down. It's a self-completing ASR. (sustain being full output level). If I break the latch line it basically turns into an AR that ramps up and down with the settings but short gate repetative pulses will let it ramp up during the gate then, release with no gate and pick up where it left off at the attack rate when the gate is re-applied. So, if you work it right, you could cascade the output in increasing up/down steps until you hit 5V. Basically...a slewed gate. That's a on board user switch selection that's staying. Now, I'll see about getting it to switch to the release after peaking regardless of if the gate is still present. So, the AD selection. Great! Just to encourage you I ordered a VC Mixer PCB which I'll do up in frac like my SVF. I LIKE that kind of encouragement. OK, figured it out simply. Each channel of the QuAD can be user selected on-board to be either an AD or ASR. So that would be AD or attack time/level & release? Whenever someone talks about an ASR, they apparently mean a shift register, but I always think of an envelope, even if I'm not sure I've actually seen one with that spec. ADR, yes. ADS, yes. But not an ASR, I think. I think the Quad VCA is a great idea. Four DC-coupled VCAs are very useful for CV over CV. And it doesn't compete with your full-feature VCA, which is AC-coupled and also has the really cool MOD input (fast becoming my favorite feature). ASR: When gated, initiates the Attack stage. (which is self-completing) Maintains full sustain level with a continued gate and doesn't start the release until the gate drops. In this case, the decay setting. AD: Initiates the attack phase on gate, self completed both attack and decay phases and ends until the gate drops and is re-initiated. @Pugix: Yeah, I like the morphing AM--->Ring mod on my full-blown VCA. These are just down and dirty basic utility-function modules. I might just have to try and put together a panel layout for that one! And remember, by providing your ready to go boards you sir are ultimately responsible for such insanity. On the up side, I have the QuAD/ASR board layed out and traces run. Now, I get to verify that everything goes to what it's supposed to.